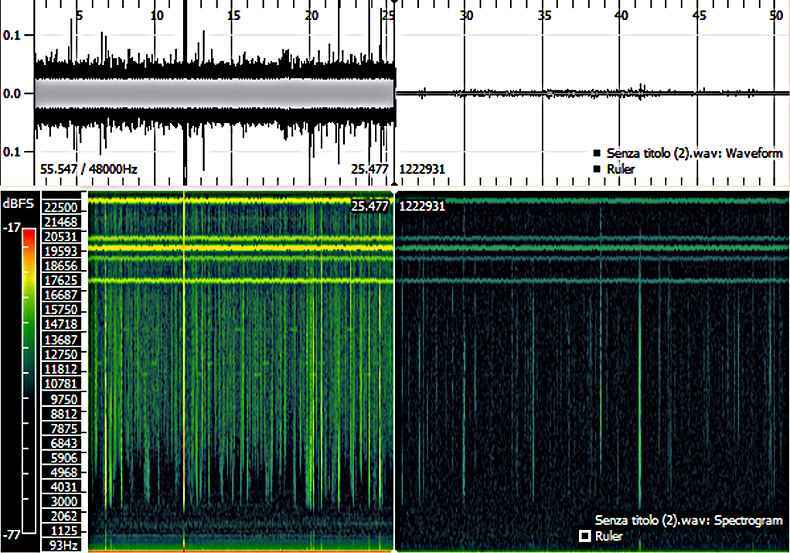 This article is a natural consequence of that about balanced antenna for VLF, this time no longer investigating the antenna itself, but its "relationship with the surrounding world." We take a moment for the "train of thought", that is, the reasons that led us to develop an active antenna for VLF and ELF of balanced type. useful band "limited" at the lower frequencies, also due to the "microphonics effect they suffer". These characteristics “complicate the life” of those who want to go "beyond listening," but do real study of the signals. The balanced antennas, as we have seen, have built-it the theoretical capacity to overcome these limitations, at least for the most part. It must, however, be installed and connected correctly so as not to frustrate all the advantages. To get to the general case, we will take a cue from a series of experiments made on the dual polarization antenna, already published on these site. From the first recordings made on the field, comparing the two polarizations there were no significant differences. Then here came the question: am I really getting into the differential? 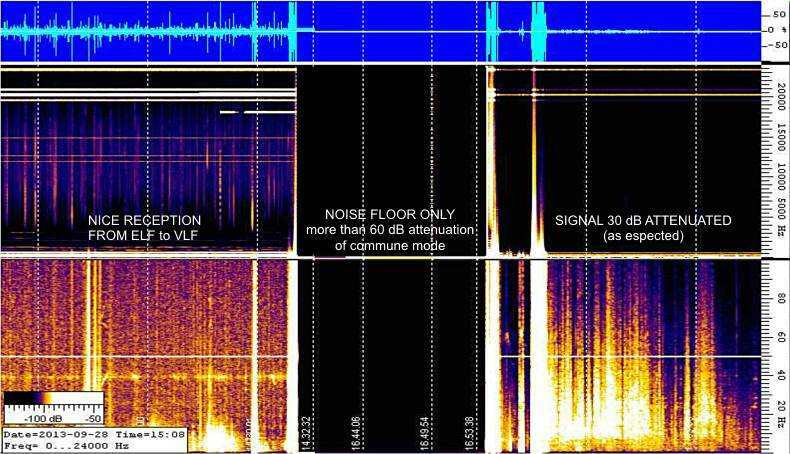 An important confirmation came from an exchange of views with my friend and expert Renato IK1QFK: he confirmed that the horizontal and vertical fields (electric or magnetic) have to be received very different, such as shown in the following spectrograms . On the first field testing with my antenna I did not receive signals significantly different between the polarizations, as well as the levels was changing together with the changing the height from the ground of the receiving structure. It was clear: in spite of the antenna structure, the reception was not the in the differential mode! Who will ever be responsible? As with all the differential structures, the "culprit" in these cases, is an insufficient CMRR! Before go further in particular, let see a small explanation. The common mode rejection ratio CMRR or (acronym from: Common-Mode Rejection Ratio) indicates the tendency of a differential amplifier to reject signals that came to both inputs. 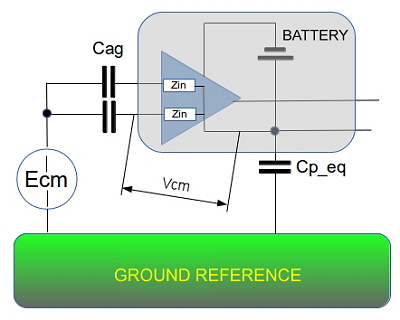 An high CMRR is important in applications where the signal of interest is represented by a small voltage fluctuation superimposed to a voltage offset (potentially large), or when the relevant information is contained in the potential difference between two signals. where Vo is the output voltage from the amplifier, V+ and V-, the two input voltages Vs and the input voltage applied in equal measure to both inputs. The antenna is considered 4m above the ground, the sensors vertically stacked and spaced 100mm and the receiver powered by a coaxial cable. So, with this geometry, if we want the common mode signals do not appear evident in the differential reception, we need 32 "extra dB" of CMRR, to add insulation between modes (at least 30-40dB). When you try to receive horizontal polarization, we must also keep in mind how the signals are generally lower than the vertical component, and then the "necessity" of CMRR also increases significantly. From these initial observations, we can say that a CMRR of 80 dB is a reasonable requirement for all situations. From this point of view, the performance of the component used (INA155) give us assurances. Unfortunately, as we shall see in the following, the values of the datasheet are "best case" and any external component to the amplifier ends to degrade the overall performance. Continuing the analysis, the first elements to be put "under discussion" in these cases are the power supply line and the direct connection between antenna and receiver. Unfortunately, their liability is limited (but significant!) and also feeding the antenna with a battery on board and installing an electrically isolating transformer along the signal path do not improve dramatically the situation. Said that, it remain the coaxial cable by itself to be investigated. But what role does play the cable? His "sin" is to connect the antenna to the receiver or there is "something else"? Let slice the problem in smaller pieces and lets try to understand. First, we redraw the circuit diagram, by inserting the elements sensors with their mutual capacity (C11 and C12), to the ground (C9 and C10) and the parasitic parameters of the structure, in particular the capacity to earth, synthesized in C8. 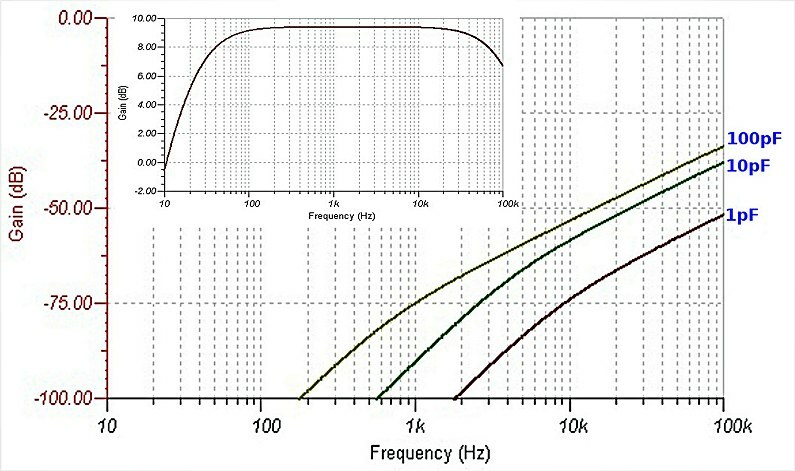 Frequency response of common-mode antenna varying (1-10-100pF) the capacity to ground. In the box the frequency response in a differential way. It's clear that even a small capacity to the soil could degrade the CMRR even of tens of dB! (at 10kHz for example from 1 to 100 pF are 20dB, 32dB 2kHz!). If you think that 100 pF of parasitic capacitance are a lot, it may be worthwhile to note that the 10m of RG58 I use as a connection from the antenna to the sound card had approximately 120pF capacity to the ground! Why this behavior? Let us help usual with a sketch and some formulas. 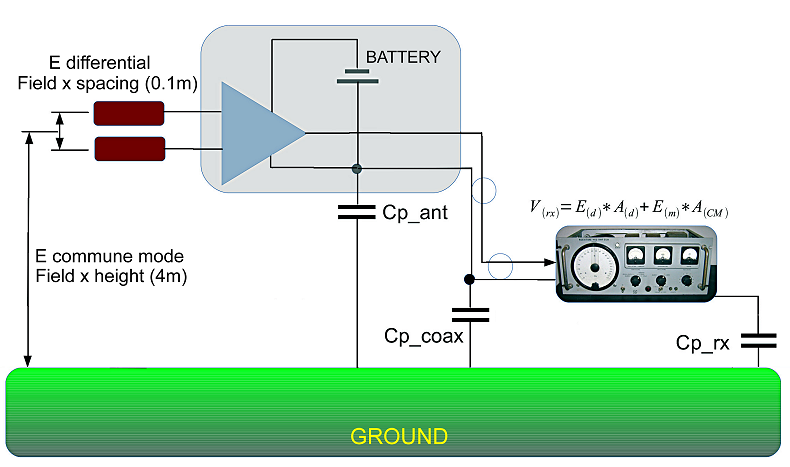 The capacity of the sensors to the ground and the antenna (and connected devices) are in series with the the common mode E-field ! Let try to describe the situation with the help of some equations, emphasizing the circuital parameters. For simplicity of writing, we define the value Cs as the capacity equivalent to the series of Cp_eq and Cag. Unfortunately, even without developing more complex calculations, it is visible that "the blanket is too short" and any optimization of a variable will be in conflict some other(s). which is equivalent to recognize that all the mechanical on constructive components of the antenna, go in the direction of reducing the CMRR of the real system. Made clear this point, you can still look for suitable solutions to minimize these negative effects. If the actions on the geometry of the antenna and its installation can be quite intuitive and limited only by their your imagination and building capacity, it is interesting to see an optimal solution to minimize the ability of the structure to the ground, removing the coaxial cable that carries the signal to the receiver. 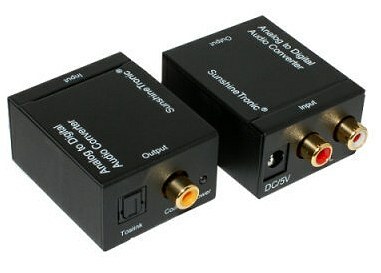 A big help comes from the world of audio, which now provides a very low cost analog-to-digital converter, with SPDIF optical digital output. An example is shown in the image. 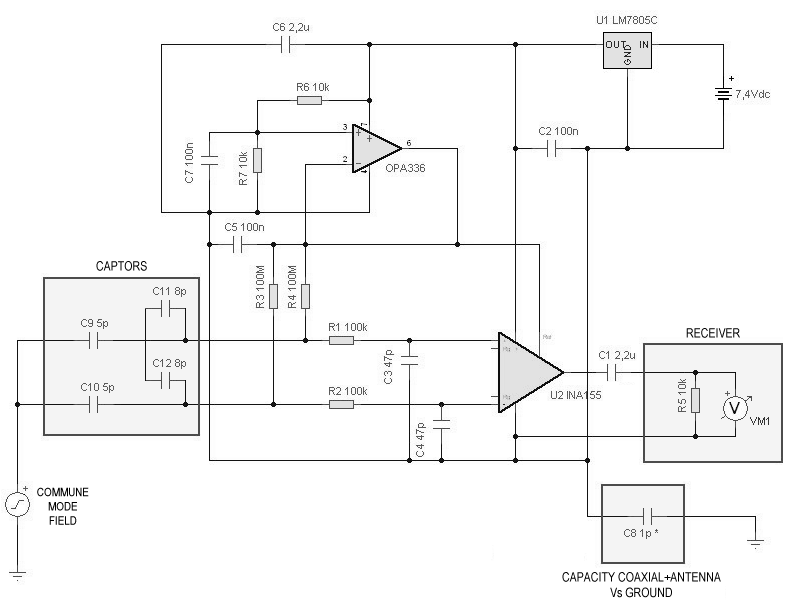 This will configure the system to show us its behaviour in differential mode and common mode. Finally the antenna or better said, the receiving system, it actually works in differential mode! The differntial structures may provide a "high potential of satisfaction" for the experimenters, as demonstrated by many tests and checks carried out. However, to operate truly differential (and hence give the advantages expected), must be "full floating", in other words, "very little coupled" with the reference plane, typically the ground. One way to guarantee this result, is to remove all electrical and mechanical conductive connections conductive (support, power cords and signal cables) in the nearby of the antenna. In particular, this solution also offers important advantages in terms of noise immunity since practically no electric or magnetic field is coupled to the signal inside the fiber. 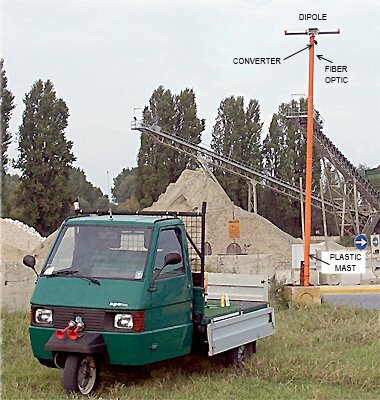 All this study has highlighted as the use of “short antennas" (or more correctly, electric field sensors) can not be separated by an accurate assessment of the installation and of the connecting elements and support. Last but not least, I wanna thanks Renato IK1QFK for the critical spirit that led me to this study and its competent support.